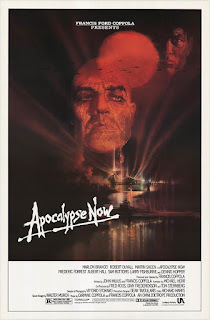 Apostle Patrick Bromley has mentioned that every time he sits down to screen Apocalypse Now, the first ten minutes convince him that it is the single greatest film ever made. Then, the next two hours and 13 minutes try to talk him out of that opinion. Well, the Pope recently showed the first ten minutes to a senior-level high school composition class. It wowed them. It made the Pope remember that lots of movies used to be like this, full of ideas and ambition and style and substance. The Plot in Brief: Lt. Willard (Martin Sheen) is given a mission by Army Special Ops in Saigon. He is to go up river and find rogue Colonel Kurtz (Marlon Brandon). Kurtz’s methods have become unsound, and Willard is given the job of terminating him “with extreme prejudice.” On his way up river, Willard will take several side trips and have many adventures involving the madness of war. Director Francis Ford Coppola famously said, “My movie is not about Vietnam, my movie IS Vietnam.” During production Coppola met with more than his share of troubles: he fired the original leading man, Harvey Keitel; Martin Sheen, the replacement lead, had a nervous breakdown and a heart attack on set and had to be sent back to the United States for a few weeks; a typhoon destroyed a million-dollar set; and, most famously, the helicopters rented from the Philippine government often flew away with no warning to go fight in a real war. Oh, and Marlon Brando showed up overweight and not knowing his lines. Any director could have faced these problems; only Coppola could have emerged with the film that he did. Apocalypse Now is a legitimate American masterpiece. The ambition and imagination of this film cannot be easily summarized in a few sentences. We see the canvas on which Coppola is painting, we sense the ideas in his head, we are exposed to the sheer ambition of his method and it makes all modern movies look like television commercials for whoopee cushions. The film has an interesting backstory. It was the brainchild of screenwriter John Milius, who thought it would be interesting to update Joseph Conrad’s famous novella Heart of Darkness, moving the locale from the Congo to Vietnam. The project went through several iterations and script drafts and at one point it looked as though Coppola protégé George Lucas would direct it, but then Lucas got the green light on a little film of his called American Graffiti. 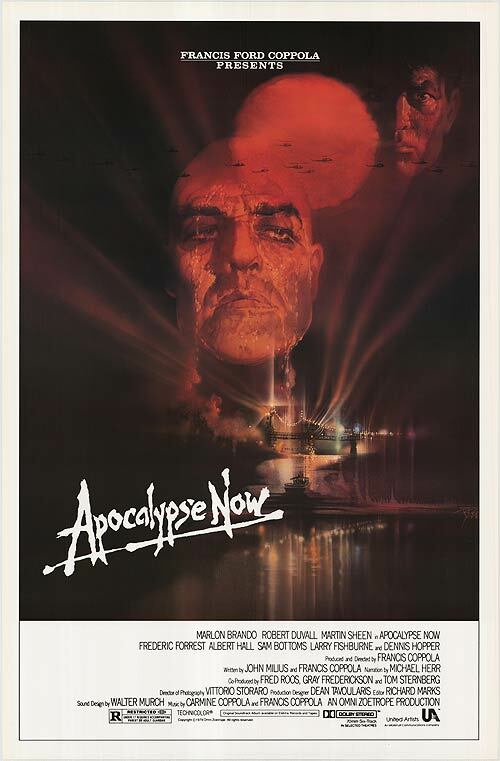 After the commercial success of both Godfather films and the critical success of The Conversation, Coppola decided to make the script, now titled Apocalypse Now, his next film. French filmmaker Francois Truffaut once famously said, ”it is impossible to make an anti-war film.” That is, that the minute the filmmaker puts war on the big screen, the violence and bloodshed will be very exciting to certain viewers, acting as more of an attractant than deterrent. Coppola here has done the seemingly impossible: he has made a film that will cause not one human to say, “I wanna go there, send me to Vietnam.” Coppola makes war seem so blood-soaked and senseless, so sudden and surreal—and I sense that this gets closer to the truth of the matter than any jingoistic wartime propaganda Hollywood had produced before. Laurence Fishburne (Morpheus in the Matrix movies) started his acting career in Apocalypse Now. Although this may have been illegal at the time, Fishburne was 16 when filming began. Coppola took him to the Philippines, put him on a boat, and then set off explosives. This isn’t film making, this is kidnapping. Fishburne looks properly baby-faced in the film—my God, it looks like he’s twelve. Though he was only 14 when production began (He lied about his age.) he was 17 when the film premiered. Fishburne’s presence reminds us that wars are always fought by children. We send children off to fight our wars. Apocalypse Now’s Three Miracles: Walter Murch’s sound editing turns this film into an aural landscape the likes of which had never been heard before. This was one of the first films to use Dolby Stereo sound. 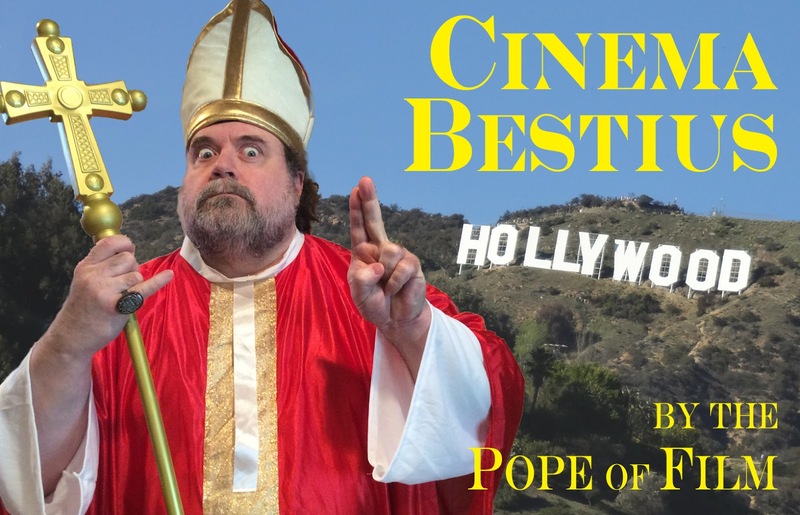 The Pope can still remember seeing this film in its original release and being floored when he heard the helicopters behind him, heard them fly over his head, and then saw them appear on the screen. Yowsa! Director Coppola has an uncanny ability to make each sequence in the film different and still have the film add up to more than just the sum of its parts. Martin Sheen gives a harrowing, career-best performance and is the glue that holds the whole enterprise together. I would like to thank my first period College Composition class for their assistance in writing this column: Katherine Benjamin, Kelly Blend, Austin Brown, Ryan Casey, Mary Cronin, Louis DiPietro, Kiara Esparza, Dino Frentzas, Cecilia Garduno-Espinoza, Ryan Hedman, Susana Hernandez, Julianna Lappano, Joe Leone, Dan Mejia, Sabra Morton, Amy Pietruszynski, Dan “Pow!” Powell, Tasia Schmidt, Kiera Shorey, Ivan Smilkov, Victor Soberanis, Rich Sprecher, Pete Tsiampis, Juliana Vercillo, and Tiffany Waldrom. You guys are the bestius. The parts of Apocalypse Now that work, work so damn well that they overrule the parts that do not (and yes, Virginia, there are indeed parts that definitely do NOT work). If any film deserves that antiquated sobriquet "Flawed Masterpiece," this one does. I've seen it dozens of times over the years, and have tried to pinpoint just when things start to go wrong. We can't pin all the blame on the Great Bloated Brando Buddha; this film is already exhausted by the time they get to the Kurtz compound. I think it was a stroke of genius to have Willard read the Kurtz dossier during the journey. Logically this makes no sense; surely Willard would have read the whole thing and destroyed it before leaving. But in the context of the film it works brilliantly to give this rather meandering film a sense of structure. We gradually learn more and more about Kurtz and his Vietnam experiences as we see one spectacular set-piece after another. Unfortunately, the film runs out of this material well before we get to Kurtz himself, and the 10 to 15 minutes between the Sampan massacre and the compound is just deadly. All the energy drains out of the film as the boat crew and we are marooned in a purple mist. Still, overall this is one awesome movie. What's with all this saying the movie's really flawed? I love-love-loooooveeee apocalypse now (if it's not my all time favourite film it's certainly my second) and have never heard people call it flawed. Sure it's long, but I love every second of it equally even the apparently much hated ending. Jesup Christ I love this movie. Theatrical... the Pope has some issues with the Redux.